One of the big differences between Marvel and DC Comics over the years has been the way that Marvel books were built around identifiable characters in a shared universe, while DC Comics were built around archetypes. It wasn’t until the late seventies that DC caught on to the kind of character-based drama that made Marvel’s superheroics so popular – and they took that style with a vengeance. At the movies, though, DC had the only really successful franchises for a couple of decades, with the superman and Batman series – Superman being the sunny dramedy and Batman [before Joel Schumacher, at least] the darker, twister drama. It wasn’t until 20th Century Fox’s X-Men that Marvel-based films began to succeed on a Superman/Batman level – because the writers, director and [most importantly] the studio took them seriously. Thus, for the first time since Batman Returns, we got superhero movies that captured the essence of their comics sources and broadened their appeal to a wider audience. Until now, though, every Marvel movie has been either dead serious, or ironic [Ant-Man is allegedly going to lean more towards the humorous, but we’re still waiting for Edgar Wright to finish a script he can live with]. With Thor, Marvel finally has its Superman: The Motion Picture. It is that near perfect blend of humor, drama, down-to-earth and cosmic that’s made the comic work for over fifty years. In Chris Hemsworth, Marvel has its Christopher Reeve. 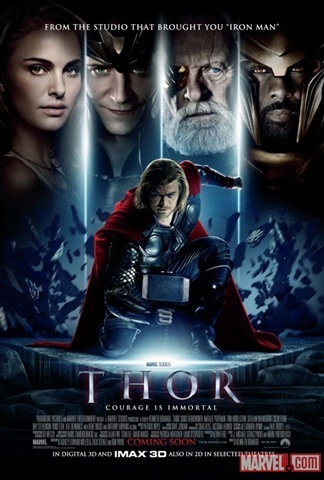 Directed with panache by Kenneth Branagh, Thor follows two plot arcs – one on Earth; one in Asgard. In Asgard, Thor’s [Hemsworth] attempt to follow up a Frost Giant incursion into Asgard with a much more devastating incursion into Jotunheim – against his father, Odin’s specific orders – gets him stripped of his god-like power and exiled to Midgard [Earth] for an attitude adjustment. Meanwhile, Thor’s half-brother, Loki [Tom Hiddleston], takes over the throne when Odin falls into the Odinsleep [a period of hibernation during which his power should be renewed]. On Earth, Thor literally falls into the lives of astrophysicists Jane Foster [Natalie Portman] and Eric Selvig [Stellan Skarsgard] and their assistance, Darcy Lewis [Kat Dennings]. 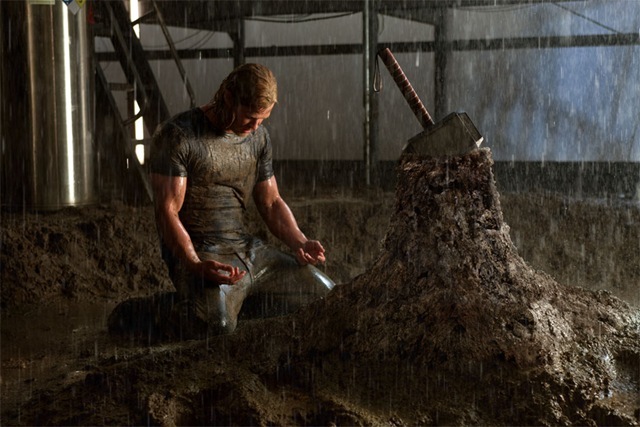 His hammer, Mjolnir, falls to earth as well, where it is tracked by S.H.I.E.L.D. and cordoned off. Agent Coulson [Clark Gregg] from the Iron Man movies is in charge of securing and figuring out what it is. Meanwhile, Thor’s charm and boyish enthusiasm wins over the scientists – and especially Jane – but it takes the realization that he is no longer a god, coupled with the possibility of danger to his new friends, to humble him sufficiently enough to be worthy of wielding his hammer once more. There’s a scene where he cooks his new friends breakfast – a sure sign that he has learnt his lesson. Elements of the Thor comics that have delighted [and possibly infuriated] fans for almost sixty years find their way into the movie: Odin quotes the inscription on Mjolnir from the comics; we meet the Warriors Three – Fandral the Dashing [Josh Dallas], Hogun the Grim [Tadanobu Asano] and Volstagg the Voluminous… er… Valiant [Ray Stevenson] and the Norse goddess of war, Sif [Jaimie Alexander] among them. There’s even a clever reference to Dr. Donald Blake, the man who first wielded Mjolnir in the comics. Even playing Odin Allfather, Sir Anthony Hopkins manages to both ground the cosmic side of Thor and ennoble it. Matching him in both stateliness and relatability is Rene Russo, as Asgard’s queen, Frigga. Idris Elba gives Heimdall, the guardian of the bridge between the nine realms, Biforst, a grave dignity and a sense of unspoken power – he sees all, hears all and commands the transportation to all realms. While Portman, Skarsgard, Dennings and the other supporting cast are extremely good, the movie belongs to Hemsworth and Hiddleston. Hiddleston’s Loki is the very epitome of sincerity – but as a wise man once said [it might have been W.C. Fields or George Burns, I don’t recall], Sincerity is everything; if you can fake that, you can get away with anything. Before our eyes, Loki goes from being mischievous to malevolent – it’s all in the way that he does the wrong things to get the right results, but does them for the wrong reasons. He is certainly the most complicated character in the film, and we will certainly be seeing more from him in the future. Hemsworth, though, gives a star-making performance as the god of thunder. Even though Thor is on Earth for what feels like hardly more than a weekend, he makes us believe his transformation from arrogant, angry, impulsive, irresistible object, to wiser, nobler, capable successor to the throne of Asgard. Kenneth Branagh does justice to both the terrestrial and the Asgardian arcs and he orchestrates action sequences that feel real even as they go well beyond the bounds of the preposterous. The use of Clint ‘Hawkeye’ Barton as one of S.H.I.E.L.D.’s agents securing Mjolnir is deftly handled – and, at least to Marvel fans, won’t feel like a blatant reference to the Avengers movie that hits theaters next year. In that regard, it’s much subtler than Iron Man 2. It doesn’t matter if you’re a comics fan who glommed onto Thor’s first appearance in Journey Into Mystery #87, or if you came aboard during the Simsonson or Straczynski rejigs – in fact, it doesn’t even matter if you’ve never read a Thor comic or seen any Marvel movies. Thor will entertain you. And if you’ve read the comics and/or seen the Iron Man movies, the tag that follows the closing credits will prove very interesting. If Thor has any flaws, one is that the 3-D is a conversion and [very] occasionally, in action scenes where multiples of characters are fighting, the edge gets a teensy bit soft and another is that there could have been more time spent on Earth – then Thor’s redemption wouldn’t have had to be crammed into such a short time [and Jane and Darcy could have had more time to fall in lust with the ultra-cut thunder god]. Overall, though, Thor is better than Iron Man, Iron Man 2, Spider-man, Spider-Man 3 and X-Men: Last Stand – and an easy match for Spider-Man 2. It combines the innocence of Lee-Kirby-Stone version, the adventurousness of the Simonson version and the shinier costume of the Straczynski version and blends them into a completely unironic, thoroughly delightful superhero movie – a movie that should spawn a sequel of its own if Avengers doesn’t throw craps.